I don't know about you guys, but I was one of the first people in line to buy the Naptime Diaries Abide Journal when it was released because summer is a time of (as Jessi says) deep, deep abiding for me. It's also the time of year when sponsored content requests and brand partnerships start to increase dramatically for all of us food bloggers, so I KNEW that I needed to recalibrate life and find a place where following Jesus and abiding in him alone came first. I feel like the timing in this is so perfect too - summer for me always signals a slow in 'have-to' and an increase in 'want-to.' I'm the daughter of a college professor and middle school teacher, so the moment we were all released from school we planned vacations and events and gatherings and (inevitably) doctors appointments. We cooked out, played outside, complained about the heat and then played some more. Summer is glorious to me, and while I love a good Fall season (hello football, game day food, perfect weather and pretty trees! ), there's never anything that feels quite like summer to me. The freedom is simply unmatched! And to celebrate let's make some super summery sweet tea, amen? 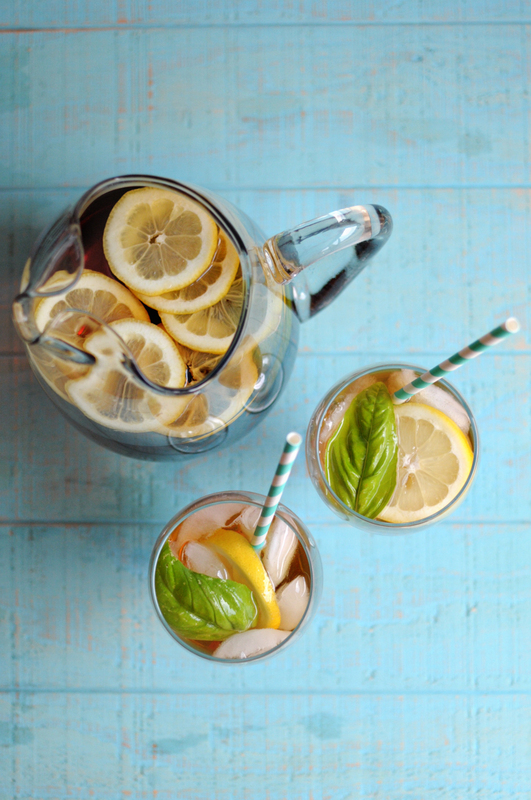 The basil and lemon are perfect partners in this herbacious and subtly sweet drink. I make mine using decaf tea because I usually drink it around dinnertime, but feel free to use your favorite! Oh, and enjoy with others. That's kind of a requirement - for both summer and this tea. First make the syrup by combing 1 cup of water and 1 cup of sugar or stevia in a small saucepan. Add the lemon zest and basil and simmer just until the sugar or stevia has dissolved. Let cool completely and then strain the syrup before using. I should note that to make 2 quarts you will only be using half of the syrup you made, but it stores well in an airtight container for about 2 weeks in the fridge. To brew my tea I usually bring just 2-3 cups of water to a boil in a small saucepan, remove from the heat, add the tea bags and let it steep for 5 minutes - no more, no less! Remove the tea bags, pour the concentrate into a large pitcher and add the remaining water and half of the lemon basil syrup. Stir to combine. Let the refrigerate until cold, then serve with ice and extra slices of lemon if desired!